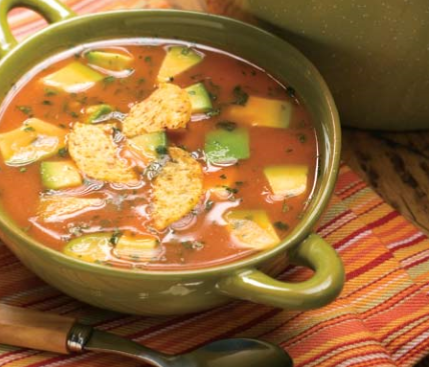 This Avocado Chicken Tortilla soup is a wonderful satisfying soup that is so easy to make. Sprinkle red pepper flakes on this soup for added heat. In a large pan over high heat, combine chicken broth, tomato soup, cilantro, garlic, and ground black pepper. Bring to a boil, reduce heat, and simmer for 10 minutes. Cool slightly, then puree small batches in a blender. Return to pan, add avocado and heat thoroughly. Ladle into soup bowls and garnish with crumbled tortilla chips before serving.